On Tuesday, Bloomberg writers Jennifer A. Dlouhy and Mario Parker reported that, “President Donald Trump is moving to clamp down on a scandal-plagued $2.25 billion market in biofuel compliance credits, embracing reforms that could block Wall Street banks from trading them. “Trump will direct his Environmental Protection Agency on Tuesday to pursue the changes as a way to quash manipulation and bolster transparency in the obscure Renewable Identification Number market, said a senior White House official. At the same time, Trump will order the EPA to take steps to enable the year-round sale of gasoline containing as much as 15 percent ethanol, according to the official, who discussed the planned announcement on the condition of anonymity. By combining the policy announcements on Tuesday, Trump is trying to deliver on his campaign promises to support ethanol while also addressing some independent refiners’ concerns about the high cost of fulfilling U.S. mandates compelling them to use the corn-based fuel additive. The Bloomberg article noted that, “But that is a difficult balancing act, and the president is bound to leave some faction displeased, said Scott Irwin, an agricultural economist at the University of Illinois at Urbana-Champaign. 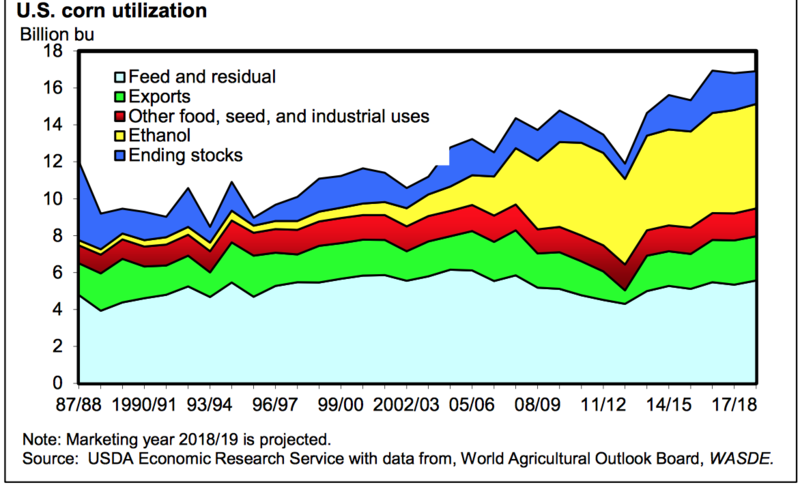 Feed Outlook / FDS-18i / September 14, 2018 Economic Research Service, USDA. Corn used for ethanol is in yellow. 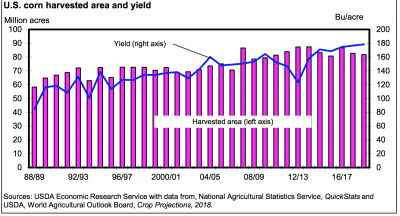 “USDA’s National Agriculture Statistics Service (NASS) second survey-based yield forecast for the 2018/19 corn crop reported a yield gain of 2.9 bushels per acre to 181.3 bushels from the previous forecast. 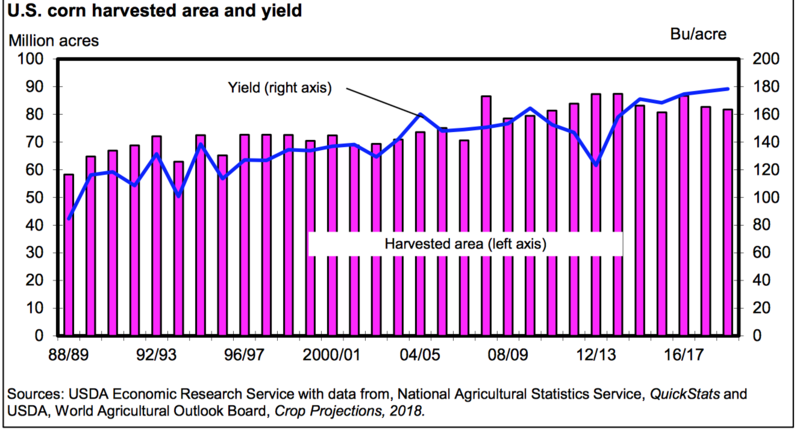 If realized, this would produce a crop of 14,827 million bushels from the forecast 81.8 million acres to be harvested, 240 million bushels over last month’s forecast.” Feed Outlook / FDS-18i / September 14, 2018 Economic Research Service, USDA. Reuters writers Jarrett Renshaw and Humeyra Pamuk reported Tuesday that, “The announcement capped a months-long effort by the White House to thread the needle between rival corn and oil industry interests, by boosting ethanol demand while also cutting costs for refiners. DTN Ag Policy Editor Chris Clayton reported Tuesday that, “As President Donald Trump headed to Iowa late Tuesday to announce year-round E15 and campaign for Iowa Republicans, there were questions over when EPA would propose such a rule and the expected legal challenges from biofuel critics. The DTN article also explained that, “EPA did not respond to questions about when the agency would initiate a rule proposal on year-round E15. Ethanol industry leaders said they think the announcement by EPA ‘could come in days or weeks.’ In the past, EPA has asserted in Federal Register rules on 15% blends that the agency did not have authority to waive the Reid vapor pressure requirement. Under current rules, retailers must not sell E15 from June 1 to Sept. 15 except for flex-fuel vehicles. 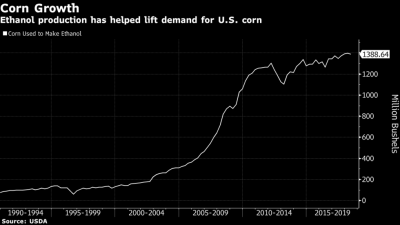 “Trump Boosts High-Ethanol Gasoline as He Courts Iowa Farm Voters,” by Jennifer A Dlouhy and Mario Parker. Bloomberg News (October 9, 2018). Dlouhy and Parker pointed out that, “Trump’s action may deliver a psychological boost to rural voters leading up to the November elections, but it won’t yield immediate dividends for E15. “Analysts expect relatively modest gains in the short term but say there’s greater potential down the road, if the EPA rulemaking survives legal challenges,” the Bloomberg article said.